Not to be confused with FedEx Ground. FedExField (originally Jack Kent Cooke Stadium) is a football stadium located in Landover, Maryland near the Capital Beltway (I-495) in Prince George's County, Maryland, United States, near the site of the old Capital Centre (later called USAir Arena in 1993 and US Airways Arena in 1996). FedExField is the home of the Washington Redskins football team. From 2004 until 2010, it had the largest stadium capacity in the National Football League (NFL), at over 91,000. Currently, the capacity is 82,000. FedExField was built as a replacement for the Redskins' prior venue, Robert F. Kennedy Memorial Stadium in Washington, D.C. In 1994 Jack Kent Cooke sought to build a new stadium on the grounds adjacent to Laurel Park Racecourse along Whiskey Bottom and Brock Bridge roads. Lack of parking facilities and support prompted a second site selection. The stadium opened in 1997 as Jack Kent Cooke Stadium, in honor of the recently deceased owner of the team, and the stadium site was known as Raljon from the first names of Cooke's sons – "Ralph" and "John". Notably, Cooke was able to register Raljon with the United States Postal Service as a legal alternate address for the 20785 zip code of Landover, Maryland, where the stadium is located, and went to some lengths to require media to use Raljon in datelines from the stadium. This ended when Daniel Snyder bought the Redskins from the Cooke estate, and the Redskins now give the stadium's address as Landover. Redskins fans at FedExField in October 2003. A special exit, Exit 16 (Arena Drive), was built from Interstate 495, the Capital Beltway. After Snyder's purchase, the stadium's naming rights were sold to FedEx in November 1999 for an average of $7.6 million per year. The waiting list for Redskins season tickets was reportedly over 160,000 names long. However, according to The Washington Post, Redskins ticket office employees improperly sold tickets directly to ticket brokers for several years before the practice was discovered in 2009. Although the Redskins have never sold out the entire stadium, the team has not had a game blacked out on local television since 1972 (when home game broadcasts were banned outright) because it does not count "premium club level seating" when calculating sellouts (their sellout streak dates to 1965, eight years before the new blackout rules were implemented). From 2004 to 2010 Redskins fans set the NFL regular-season home paid attendance records. In 2005 the team drew a record 716,998 fans overall. 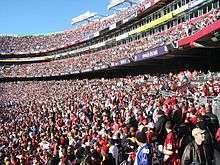 The December 30, 2007, 27–6 win against the Dallas Cowboys was the most watched game in Redskins history, with 90,910 fans in the stands to see Washington clinch a playoff spot. On January 8, 2000, the Washington Redskins defeated the Detroit Lions 27–13 in the first NFL playoff game at FedExField. On December 29, 2002, the Washington Redskins defeated the rival Dallas Cowboys, 20–14. This game was Darrell Green's final game. He played 20 seasons with the Redskins. The game also broke a 10-game losing streak to the Cowboys. Redskins players enter the field during a game in October 2006. FedExField during the 2004 BCA Classic. The stadium has five levels – the Lower Level, the Club Level, the Lower and Upper Suite Levels, and the Upper Level. The Lower, Club, and Upper Levels are all named after important figures of the Redskins, NFL, and Washington, D.C. area. The Lower Level is officially named "George Preston Marshall Lower Level", The Club is named "Joe Gibbs Club Level, and The Upper Level is called "Pete Rozelle Upper Level." The Suite Levels have 243 suite, lounge, and Owner's Club luxury boxes and 15,044 club seats. After Daniel Snyder purchased the Redskins, five rows of "Dream Seats" were installed in front of what had been the first row of the lower level, extending down almost to the level of the field. Seats in the previous first row of the lower level were sufficient to see over the players on the sidelines. FedExField hosts the annual Prince George's Classic college football game, which is a game usually between two historically black universities. It has hosted several other college football games as well, including the 1998 game between the University of Notre Dame and the United States Naval Academy. the 2004 Black Coaches Association Classic between the University of Southern California Trojans and the Virginia Tech Hokies, and the 112th Army–Navy Game. FedExField is not well known as a soccer venue, as D.C. United of Major League Soccer elected to remain at RFK Stadium after the new stadium's opening, and is now planning to build a new D.C. United Stadium within the city. FedExField has been used for some international soccer matches — both for the United States and also for El Salavador. On March 28, 2015, Argentina defeated El Salvador at FedExField before a crowd of 53,978. On June 7, 2014, the stadium hosted a doubleheader. Spain, the 2010 World Cup winner, defeated El Salvador 2–0 in a warm-up match in front of a crowd of 53,267 before the 2014 World Cup; in the other game of the doubleheader, D.C. United played Columbus Crew to a scoreless draw in D.C. United's first time hosting an MLS regular season game at FedExField. It hosted four preliminary matches and one quarterfinal doubleheader in the 1999 Women's World Cup. On July 1, 1999, the United States women's national soccer team defeated the German women's national team 3–2 in the FIFA Women's World Cup 1999 quarterfinals. FedExField has also hosted a number of club soccer exhibition matches. During the July 2005 World Series of Football, D.C. United hosted Chelsea F.C. there; the 31,473 spectators represented D.C. United's third-highest ever home attendance. On August 9, 2009, D.C. United hosted another international friendly against Real Madrid at FedExField. On July 30, 2011, Manchester United ended its 2011 summer tour with a 2–1 win over F.C. Barcelona at FedExField in front of 81,807 fans. This represented the largest soccer crowd in D.C.-area history. FedExField was used on July 29, 2014, in the International Champions Cup as Manchester United played Inter Milan; the game ended in a 0-0 draw and the shootout was won by Manchester United 5-3. Many fans feel FedExField does not compare favorably with RFK Stadium. Sports Illustrated's rankings of "NFL Fan Value Experience" rated FedExField 28th out of 31 NFL stadiums. In January 2007, The Washington Post reported that Redskins owner Daniel Snyder was meeting with Washington, D.C., officials about building a new stadium in order to return the team to the District. There were also reportedly meetings with Virginia Governor Terry McAuliffe. Problems were created when the design of the stadium was modified in an effort to maximize revenue. Over the years, "party zones" requiring paid membership (such as the Touchdown Club and Tailgate Club) have sprouted on the concourse outside the stadium. Entrances adjacent to the "party zones" are no longer accessible to fans who do not purchase a "party zone" membership. Installation of "Dream Seats" are another modification of the stadium that has increased revenue. The original architect calculated the lowest possible height at which the first row could be set in order to still see the field over the players standing on the sideline. In 2005, eight years after the stadium opened, 1,488 premium "dream seats" in three rows were added in front of what was the first row when the stadium was built. Because some of these seats are too low to see over the players on the sideline, occupants of these seats stand in order to see the game. In the 2011 off-season, nearly 10,000 seats were removed from the upper deck to reduce capacity to around 83,000, making FedExField the second-largest venue in the NFL during the 2011 season. A Redskins team official admitted that the seats were removed due to lack of demand. During the 2012 offseason, 4,000 additional seats were removed to make way for new suites and party decks and the stadium's capacity dropped to 79,000. The seats that were removed permit the team to continue to sell out and avoid the NFL television black-out rule. 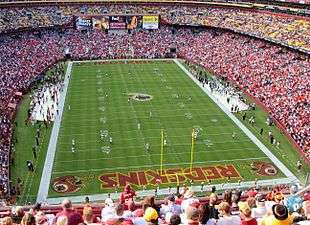 In December 2013, the Redskins set a record for the lowest announced attendance ever at FedExField with 56,247, most likely because of the team's poor record at the time and inclement weather. Attendance in the 2014 season averaged less than 78,000 per game, and never rose above 81,000. On June 1, 2015, The Washington Post reported that another 4,000 to 6,000 seats, primarily in the top eight rows of the upper decks, were removed during the 2015 off-season. Team officials said the removals were made due to "season ticket holder feedback", and declined to say how exactly many seats had been removed. The location of the stadium has made traveling to it through public transportation difficult and time-consuming. The stadium is about a mile away from the Morgan Boulevard station, the nearest Metro station to the stadium. Furthermore, federal regulations prohibit publicly paid shuttle service from public transit agencies as long as a private service is available. Since this method is not cost effective, fans taking public transportation must walk to and from the stadium. That trip usually takes as long as 20 minutes on most days. More recently, the field had fallen under considerable criticism for the poor quality of the grass surface. In 2013, the Redskins installed Latitude 36 sod and also installed a new drainage system along the sidelines. 1 2 "FedExField Stadium Guide". Washington Redskins. November 5, 2015. Retrieved November 5, 2015. 1 2 "FedExField" (PDF). 2015 Washington Redskins Media Guide. Washington Redskins. August 28, 2015. Retrieved November 5, 2015. 1 2 3 4 Jones, Mike (April 2, 2012). "Redskins to Remove Another 4,000 Seats From FedEx Field". The Washington Post. Retrieved September 20, 2014. 1 2 3 4 5 Steinberg, Dan; Jones, Mike (July 14, 2011). "Redskins Say They Were Unable to Sell Season Tickets for Seats Removed from FedEx Field". The Washington Post. Retrieved May 6, 2012. ↑ Illuminating Engineering Society (1998). Lighting design & application: LD & A. 28. Illuminating Engineering Society. p. 39. Retrieved May 6, 2012. ↑ "FedEx Field". Featured Projects. Clark Construction Co.
↑ "Where a Stadium Soon Will Grow". The Washington Times. March 23, 1996. Retrieved October 23, 2011. ↑ "Goodbye to Raljon, and good riddance". Baltimore Sun. August 20, 1999. ↑ Grimaldi, James V. Washington Redskins Sold Brokers Tickets Despite Wait List. The Washington Post, 2009-09-01. ↑ McKenna, Dave (July 6, 2007). "Scarce Tactics: Just How Much Demand is There for Skins Tickets These Days?". Washington City Paper. ↑ "No Messi, but Argentina is still too much for El Salvador". ↑ "NFL Fan Value Experience: Washington Redskins". SI.com. November 7, 2007. Retrieved April 23, 2008. ↑ Fisher, Marc (January 11, 2008). "Next 2 D.C. Stadium Deals Might Smell a Bit Sweeter". The Washington Post. Retrieved April 23, 2008. ↑ Fisher, Robert (January 6, 2013). "Next 2 D.C. Stadium Deals Might Smell a Bit McCartney". The Washington Post. Retrieved January 6, 2013. ↑ Heath, Thomas (August 20, 2005). "Redskins' Revenue Reaches $300 Million". The Washington Post. ↑ "Redskins set lowest FedEx Field attendance mark". The Washington Post. ↑ Steinberg, Dan; Allen, Scott (June 1, 2015). "For Third Time in Six Years, Redskins Remove Seats From FedEx Field". The Washington Post. Retrieved June 1, 2015. ↑ Weiss, Eric M. (August 6, 2008). "Metro Shuttle To FedEx Field Is Scuttled". The Washington Post. Wikimedia Commons has media related to FedEx Field.